No matter what the cause—whether it’s flooding, a major plumbing accident or even water leaking from the ceiling or roof—our team brings a thorough, knowledgeable approach to water-damage carpet restoration. For one, the stakes are too high for you as a home or business owner. Water-damaged carpet is a serious hazard, and not just because it can—and eventually will—harm the carpet beyond any hope of repair. The other area of concern is that moisture left in the carpet promotes mold growth, which is bad for your health and the quality of the air in your home. 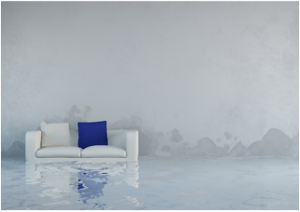 Water damage in the carpet can also hide serious damage underneath, potentially leading to unseen structural damage due to the relentless exposure to moisture. For most property owners, the goal is to save the carpet in the wake of water damage and avoid having to rip it out and invest in all new carpeting. Even in cases where you think the rug or carpeting is beyond repair, you’ll be amazed what our technicians can do using our state-of-the art methods and equipment. Our goal is to return it to its original condition and to do so quickly—because the sooner we can start the process, the more success we’ll have. Meanwhile, of course, we know you’re eager to get back to your life or to business with minimal downtime due to water damage. Our approach to water-damaged carpet begins with evaluating the damage itself to create a plan of action as quickly as possible. Our primary method involves “top-down” drying, which is preferable because it works without having to lift or detach the carpet from the floor. We also use air movers and finally commercial-grade dehumidifiers to speed the drying process. Begin with turning off the power source and taking care to unplug any electrical cords in the affected area or areas. Next, of course, you want to stop the water source itself if possible, and begin doing the best you can to soak up water by mopping and laying out rags and towels. Remove furniture, window treatments, moveable rugs and anything else that’s coming into contact with the water wherever possible to prevent it from becoming damaged as well. If it’s safe to do so, turn on the air conditioning or fans to begin the drying process—but don’t risk using electrical fans in the case of flooding or sitting water. These are relatively fast and simple steps to take in the immediate aftermath of flooding or unexpected water exposure. Next, call us. We’ll come as quickly as possible to get to work restoring your water-damaged carpet. You’ll be glad you called!